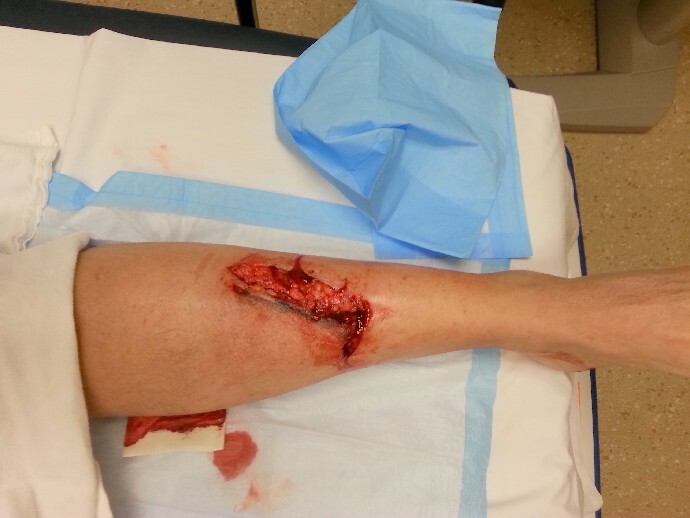 Shark Attack, with pictures. Not for the squeamish. Well that’s what I’m telling people. It happened two Sundays back about eleven in the morning. I was working on the boat, tearing out and replacing old waste water piping. Most of the pipe is in the bilge, not the healthiest spot in which to spend time, and I was lying on the galley floor reaching into the void to thread some more pipe when I must have kicked the companionway steps. The steps are a heavy wooden four step flight that mount into clips on the bulkhead and have pegs that drop into holes in the deck. Having done what was needed below I needed to climb the steps into the main cabin. Thinking only of the next job I was off up the steps, well I got to the top when they let go, sliding down the bulkhead and onto the galley floor. 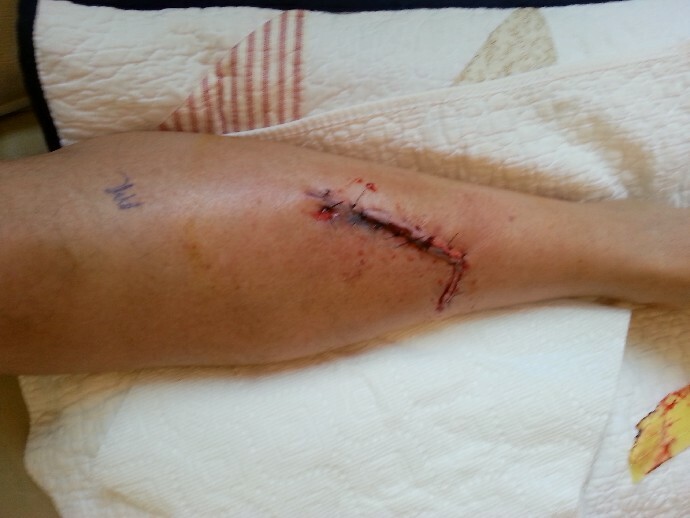 My left leg caught the left mounting clip, opening up an seven-inch gash from ankle to mid calf. It felt as if I had been hit in the leg with a hammer, and my first thought was “I’m going to have quite a bruise there”. Then I saw the extent of the damage, kind of like a busted watermelon. I took off my dirty gloves and pushed the wound shut with both hands to see if it was something I could fix with a few band-aids or some electricians tape, but it was clearly beyond that. I took off my t-shirt and tied it around the leg and started off the boat, up the dock and into the house in a kind of Quasimodo hobble. Nobody home of course, and as far as I could see, nobody on the creek. Called the missus on her cell, (15 miles away at the supermarket) and asked her to come and take me to the ER. In the meantime I swapped the t-shirt on the leg for some gauze pads and an elastic bandage to stop the remaining bleeding (surprisingly little, given the wound). I had a quick wash and changed my clothes (my mother always said “Never go out in dirty underwear, you never know when you might be run over”) and an hour later I’m in the local ER 15 miles away. Nice people there, they find me a wheelchair, then a gurney (?English unknown) and take off the dressing to have a look. That’s when I took the first photo (with my cell phone, so not the best quality). Nurses hum and haw, call the on duty doctor, she has a look decides she does not want to try to close it up so says she will have me transported to the Trauma Center at the big hospital. Ride an ambulance then an elevator to a private bed. Half an hour later the Chief Trauma Surgeon arrives with a swarm of interns about him, he is about sixteen years old and the interns are younger. Orders X-Rays, EKG, Saline drip, IV antibiotics and a tetanus shot and says he will fix it “as soon as an OR is free. It may be 20 minutes it may be three hours” is his parting shot. It’s three hours and I’m beginning to think I should have tried the band-aid route, (or duct tape) when I am hauled to the fifth floor OR and “prepped” a lot of questions, the trauma surgeon initials my left knee (just to be sure I don’t get an appendectomy?) and I am transferred into the freezing OR and onto an operating table. Table? It was about fifteen inches wide, I asked the guy hooking me up to the gas what they did with big people, he said “They just hang over a bit but the surgeons do not have to lean over too far to work”. Strange deal, they spread your arms out horizontally on two small tables and hook up all their bits and pieces, I asked the gas guy “What’s next a couple of nails?” “Nope” he said “You are going down” and I was. Monday morning the trauma surgeon came around again felt my left foot, offered me painkillers (I declined) and departed. “Take the dressing off after 24 hours and resume normal activities as tolerated” they told me so I did. Started hobbling around on Tuesday, rejoined my breakfast club on Thursday and had an appointment to see the surgeon last Tuesday to get the sutures out. Have not yet got back on the boat except to clear up the bloodstains, maybe after vacation. Still hobbling a little and starting to itch (good sign). Quite a tidy job considering, Initials are just below the knee. The shark attack story does elicit a degree of respect almost completely absent when one tells the truth. This is exactly why I never went in for boating. Boating is dangerous! Seriously, I don’t climb ladders or use the chain saw these days unless somebody else is in The Cave. I’d be a long way from help if I needed it, as were you and accidents can happen out of the blue. Oh blimey, JW, very nasty indeed! Glad it’s healing. Don’t be tempted to scratch, and take it easy. Looks like the sort of injury you might get tripping over a kerb stone, coming back from the pub! (Been there, done that!!) Seriously though, I hope you are fully recovered soon. Oz is right boating is dangerous. He is also right about ladders generally, spousal unit is getting a bit dickery and I have declared a fatwah on such activities when I am not home to call the ambulance!! Take it easy and get well soon and don’t overdo it! Not that one calls the ambulance round here with gay insouciance, one gets a bill for $500 for the privilege! That would stop 999 calls in a hurry in the UK A&E dept would be deserted! Good to hear from you again, LW, and hope you make a speedy recovery. Sorry, add “wife” after “his” in penultimate line. Definitely time for bed again – see other comment. Looks pretty grim. Hope you recover soon. Agh, LW. Your horrendous experiences have been somewhat overshadowed by the horrors of The Referendum but my sympathies and best wishes for a speedy recovery. Yes boating can be dangerous, and I’m always surprised that more people don’t injure or kill themselves, but I hope you don’t meet this particular “shark” again. That second photo shows some local swelling, so I’d advise rest and elevation in between activities. Oedematous tissue heals more slowly. Take care. That’s a really cool ‘after’ pic, then I realised that you’re not allowed to enter! Thanks for all your good wishes, everything considered I would rather not have done it, bad timing about the Piccie comp. too as Soutie says. Retrospectively, I was clearly plumbing not boating but all my own fault, too much haste, not enough care. Pseu: Swelling is gone, bruising is gone, just some adhesive straps holding the leg on. Resting all week on vacation. Might take an after shot at the weekend. Picky, JW. I’ll trade you a medium Great White for a large Barracuda. Can’t be fairer than that.